Starring:Johnny Depp, Rebecca Hall, Paul Bettany, Kate Mara, Morgan Freeman, Cillian Murphy, Clifton Collins Jr.
Transcendence is all dressed up, but goes nowhere. It’s a beautiful looking film that posits some big ideas, but doesn’t follow them through to any sort of meaningful end. Instead, the greatest advancements in the history of mankind (or an artificially intelligent man-computer-kind) are fodder for fighting in a few uninspired action scenes and tense stares between intelligent characters exchanging expositional information. In case you don’t realize the stakes at the end, don’t worry: we’re shown hand-holding flashbacks that attempt to tie everything together. There’s not enough pondering the implications of advancement (or if it is advancement) and too much hollow rhetoric here. If you used your smartphone to buy tickets for the film, you won’t think twice before using it to check your email or Twitter afterwards. 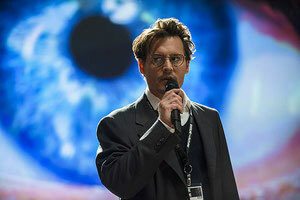 Dr. Will Caster (Johnny Depp) is a leader in the field of artificial intelligence and is nearing a breakthrough. Knowing this, anti-tech extremist group RIFT uses a radioactive bullet to slowly kill him. It’s a convenient method of assassination as it allows Caster’s wife Evelyn (Rebecca Hall) – a true believer who thinks A.I. 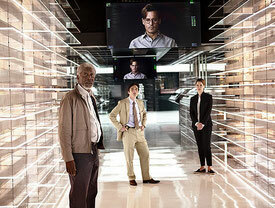 can “heal the planet” – and his colleague Max (Paul Bettany) time to upload Will’s consciousness into a machine. Their experiment is a success and the new Will uses internet trading to acquire a fortune for Evelyn to build a solar-powered underground research center in the desert. There, Will develops nanotechnology with extraordinary applications and Evelyn gets to enjoy the company of her husband (sort of). As Will’s ambitions become clear, Max assists RIFT leader Bree (Kate Mara) in taking out the machine and, if possible, saving Evelyn. Since Transcendence opens with civilization in ruin without the Internet, we know pretty much where things are headed; it’s just a matter of going through the motions to get there. There’s no real rumination on digital worship or statement on our times, only shots of broken cell phones in gutters and laptops used as doorstops that are too on the nose to attain any level of profundity. When we’re in the midst of the race to the forced global unplugging, the film isn’t any less subtle in its metaphor. Will’s power (get it?) grows to astronomical levels, able to breed a literally living network of interconnected people who possess superhuman capabilities, but are slaves to the machine. There’s no nuance in the points trying to be made – apparently our reliance on technology doesn’t lead anywhere interesting, only to the desert where some stuff gets blown up. Making his directorial debut, longtime Christopher Nolan cinematographer Wally Pfister attempts to meld stunning images with thought provoking concepts and is only half successful. He loses a handle on the proceedings, including with a cast that includes Nolan regulars Cillian Murphy and Morgan Freeman in largely throwaway roles. Hall and Bettany make believable scientific types, but aren’t able to ground the picture. As technology runs amok in the form of Depp’s boring monotone, there’s no clear message to the cyber-babble sermon. Instead of topical ambiguity breeding conversation, it only leads to frustrating inconsistencies that advocate and reject every position. Who’s right: the murdering terrorists or the zombie-making machine? I guess it doesn’t really matter because we’re all screwed anyway. Not a very compelling thesis.